By presenting problem solving in purposeful and meaningful contexts, MATHEMATICAL EXCURSIONS, 2/e, provides students in the Liberal Arts course with a glimpse into the nature of mathematics and how it is used to understand our world. 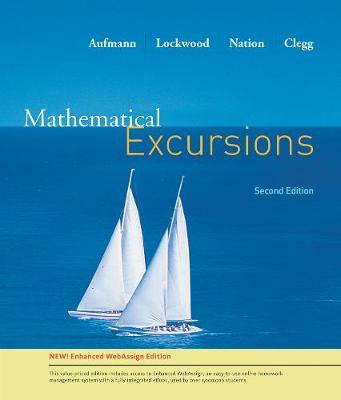 Highlights of the book include the proven Aufmann Interactive Method and multi-part Excursion exercises that emphasize collaborative learning. An extensive technology program provides instructors and students with a comprehensive set of support tools. This Enhanced Edition includes instant access to WebAssign ®, the most widely-used and reliable homework system. WebAssign ® presents over 500 problems, as well as links to relevant textbook sections, that help students grasp the concepts needed to succeed in this course. As an added bonus, the Start Smart Guide has been bound into this text. This guide contains instructions to help students learn the basics of WebAssign quickly.